Trailhead: Transfer Rd./East Bull Rd. 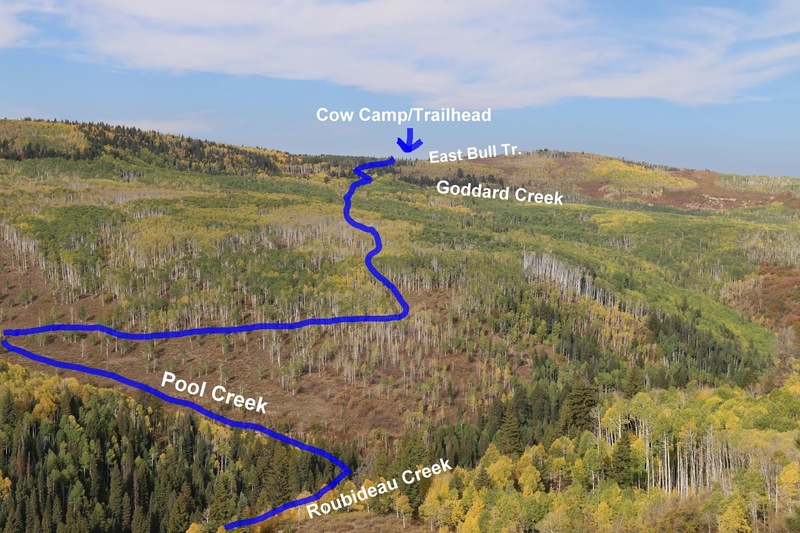 The Old Roubideau Pack Trail is located in the southern area of the Plateau Division of the Uncompahgre National Forest west of Delta and Montrose, Colorado. The south end of the trail begins off of Forest Road #508.3A near its junction with the Transfer Road. From there it descends into the Roubideau Creek drainage which it follows downstream until it reaches Pool Creek near the 1.6 mile point. 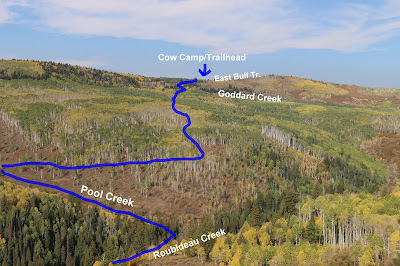 After traveling up Pool Creek for almost a half mile the trail climbs out of the drainage and crosses over the plateau to the Goddard Creek drainage. From there the trail climbs out of Goddard Creek eventually coming to an end near a cow camp that is at the end of the East Bull Road. For this post we began at the southern trailhead off of the Transfer Road. We got there by driving up the Transfer Road from Olathe for 24 miles. The Transfer Road can be pretty rough in a few places. It doesn't require a high clearance 4-wheel drive vehicle during good conditions but you might find it too rough for the family car. The rough spots are where they have ground the ridges off of outcropping rocks. Even though they have smoothed it out quite a bit doing this you still need to slowdown going over them. The northern trailhead is more preferable for route finding and can be easily accessed from Delta which is about 42 miles away by coming up the 25 Mesa Road. From Montrose the preferable routes are via the Dave Wood Road, 44 miles, or Highway 90 which comes out to 41 miles. From the southern trailhead the trail passes through a gate and begins a moderate descent into the canyon. There are several switchbacks that make easy work out of the descent down the steep slopes of the canyon. From this vantage point you can look out over the area and get a general idea of what the terrain looks like that lies ahead. The blue line shows the approximate course that the trail takes. The East Bull trail does in fact run up the bare hillside that you can see in the distance and the cow camp that is at the other end of the Roubideau trail is just inside the treeline at that point so you can actually see all the way to the other end of the trail and most of what is in between. At the point where the trail gets all the way down the mountain it turns sharply and heads down the Roubideau Creek drainage. There are cow trails and such that head up the drainage in the other direction that might be fun exploring and might be of interest to hunters as we did hear some elk up that way. 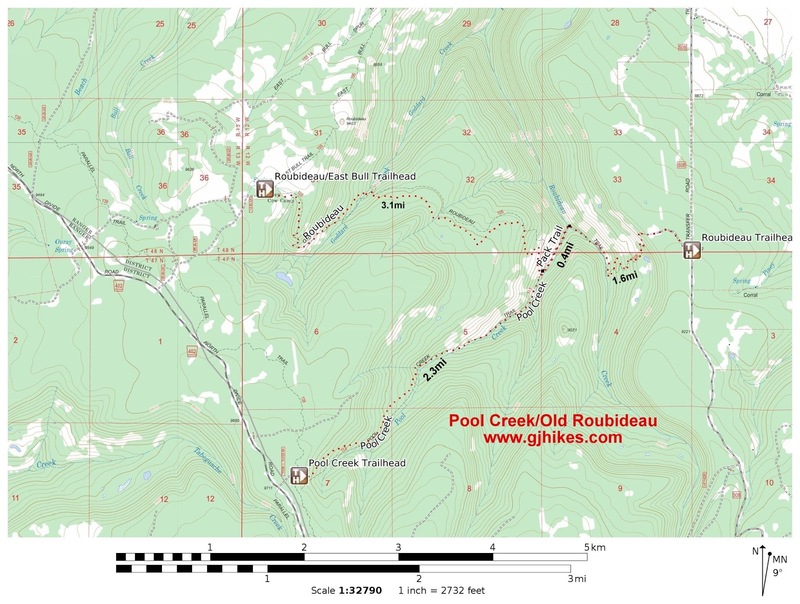 The trail stays well above Roubideau Creek until it reaches the mouth of Pool Creek. At that point the route crosses the creek and heads up the Pool Creek drainage. Keep your eyes peeled when you approach the creek and you might see a few fish darting for cover in the very shallow water. Without a GPS and a map it is hard to tell just where to begin climbing out of Pool Creek. There are at least a half dozen cow and game trails to choose from. As you get higher up the side of the mountain it becomes almost impossible to pick out the correct route to take. Even coming from the other direction the trail seems to disappear but at least coming from that way you can see the trail below you and can simply head toward it. Once the trail gets up the side of the hill it becomes much easier to follow. The Forest Service has done a good job keeping most of the timber cleared so you can follow the well worn path that is lined with cut logs. Even though there are no trail markers to go by there are dozens of inscriptions carved into the aspen trees along the trail. It is interesting to note the dates of the carvings and compare their age to the growth of the tree. As the trail makes a short drop into the Goddard Creek drainage there is a marker just above the creek. At present this is the only marker on the entire trail. After crossing Goddard Creek the trail heads up the drainage staying on the right side of the creek but not right next to it. As the trail continues up the Goddard Creek drainage it slowly works its way up the side of the hill and out of the canyon. Near the top of the hill there are 1 or 2 switchbacks that make the climb a bit easier. The trail levels off for the last half mile as it travels pleasantly through the forest. The Old Roubideau Pack trail comes to an end at its junction with the East Bull trail. From here there is a cow camp just across the road to the left with room to park a little farther away. It is just under 1 mile on out to the Divide Road. When we got to this point there was a bobcat that walked out onto the road from the cow camp. It stood there watching us while I changed the camera to the zoom lens after which it walked away into the trees. We got a couple of photos with the regular lens but as it was standing in the shadows they aren't very good. A glance at the elevation profile might be helpful to get a feel for the physical effort that the trail requires. The round trip elevation gain for the Old Roubideau trail is 2,792 feet making for a pretty good workout. The Old Roubideau Pack trail is probably much easier to follow when starting from the East Bull end of the trail. If you do start from the Transfer Road end there is really no reason to park out by the Transfer Road. You can cut about 6 tenths of a mile off of the round trip distance by driving in on Forest Road #508.3A. When it is dry a car can make it okay. One of the reasons that we wanted to post the Roubideau Pack trail was for its historical significance. Antoine Roubideau was a Frenchman that had a trading post along the Gunnison River at the present location of Delta, Colorado back in the 1830's or 40's. The exact time he arrived is unknown and he eventually ended up getting run off by the Utes and headed over to the Utah territory and set up a trading post there. 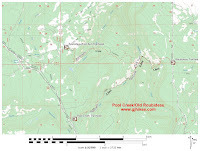 Those interested in hiking the trail should have advanced route finding skills and preferably a good GPS and map. This is an area where you could quickly become disoriented and find yourself lost in the wilderness and in dire straights. That said, casual hikers should be able to easily hike the first mile or two from either end of the trail without being overly concerned. If you would like to see it for yourself then all you have to do is 'Take a hike'.